The Darkness is God’s sister? And, wait, did Sam have a vision of the cage that’s been keeping Lucifer and Michael trapped since Supernatural Season 5 Episode 22? TV Fanatic staff writers Sean McKenna and Christine Laskodi and The Winchester Family Business’ Alice and Nightsky have plenty to talk about when it comes to Supernatural Season 11 Episode 6. So join them as they discuss “Our Little World,” and catch all the excitement again when you watch Supernatural online now! Nightsky: The final image of the Cage. It was really well done and opened up so many possibilities. Together with the dramatic scenes of Sam having visions, I am intensely drawn to this story line. Alice: I really loved the back and forth between the scenes of Castiel and Metatron, Dean, Crowley and Amara, and Sam fighting the demons. 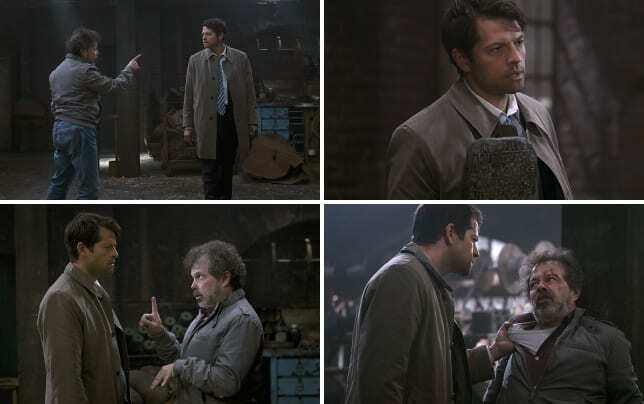 The quick cuts between Sam fighting and Castiel beating Metatron were great, then it moved to Amara and Dean’s strange little encounter and a broken Metatron finally telling the story of The Darkness. It was so compelling. Normally when they do that fast paced back and forth it doesn’t work. It was fantastic this time. 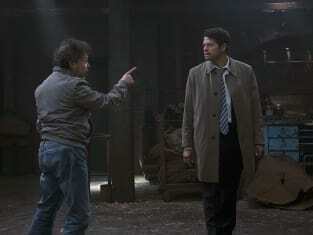 Christine: I loved the Castiel and Metatron stuff. It was also a great resolution to Cas' binge-watching, which I wasn't a fan of, but it all made sense after it was a PTSD effect. I also noticed that this is two episodes in a row where "faking it" has been brought up. Len last week and Metatron this week, so I'm still sticking with my theory that Dean is faking it as well. Sean: Hmmm. Dean faking it, you mean like he doesn’t have a soul? I’ve been hearing that theory floating around, and I’m curious if that’s what’s going to be revealed. Still not sure about that overall, but as for my favorite scene, it was Sam fighting the demons and trying not to kill them. I love that he’s continued to work on his new goal of change, and that wasn’t just dropped. Plus, his “two out of three ain’t bad” line was funny, and it showed that Sam’s no kill rule isn’t just some easy switch. It’s still going to be a tough road, that’s for sure. What are your thoughts on the Darkness being God's sister? Nightsky: I’m worried about that development. It is pretty wild, and it bothers me a bit. I had speculated on other background stories for the Darkness that were all easier to swallow. Staying just close enough to established religious tenets is what makes Supernatural relatable. In fact, my review of Supernatural Season 11 Episode 1 applauded bringing it back to basics that included the audience’s reality, but this idea pulls it away again. Having said that, the writers have opened up a brand new, expansive myth arc that they can work for a long time. They have earned our trust this season, so I’m willing to give them the benefit of the doubt. Alice: That isn’t too surprising given this show. It loves showing the epic battles among family. We had the dysfunctional archangel siblings, the twist on Cain and Abel, so why not God himself having kin? It adds up in a show that’s primary theme is family. What I want to know is how exactly does Amara hope to find God? It’s not like Sam and Dean where they know each other’s habits. What does she plan to do? Why does everyone fear her? There’s a lot of story left to tell so this could work. Christine: I was really surprised, and like Nightsky, it makes me a little nervous. Not that it's not easy to swallow, but more that it feels like a repeat of Michael and Lucifer. It's always siblings going against each other with the Winchesters. I hope they find a way to make this sibling rivalry unique. Sean: It was a cool reveal, and I really like the sibling aspect again, just like Sam and Dean, and even Lucifer and Michael. But it also makes me think about Supernatural’s endgame. The Darkness seems like the biggest force Sam and Dean have had to deal with, and bringing back connections to Lucifer, to God, to Sam and Dean getting back to basics while providing some change, it all feels sort of like we’re headed for a big finale. Like series finale. I love the way Supernatural Season 11 has been progressing, a very strong start, and it’s great to see Sam and Dean time and again, but I can’t help but wonder if the writers are mapping out a way to solidly conclude the series. I mean, where do you go after taking on God’s sister? 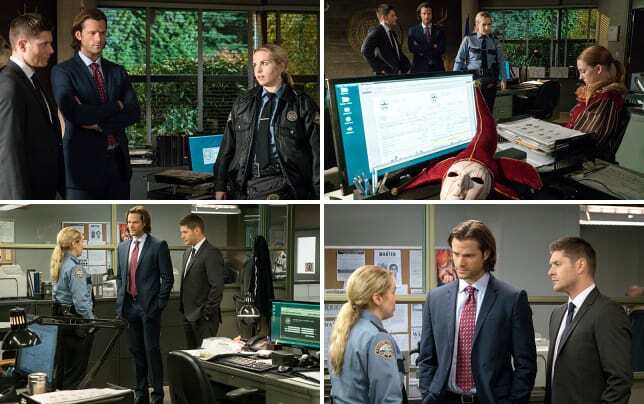 Supernatural Photos from "Our Little World"
Will we see God appear this season? Nightsky: Would Sam and Dean work with God? That seems ludicrous. Keeping Team Free Will on their own is what makes them humanity’s heroes. Would they oppose God? That seems risky on so many levels. 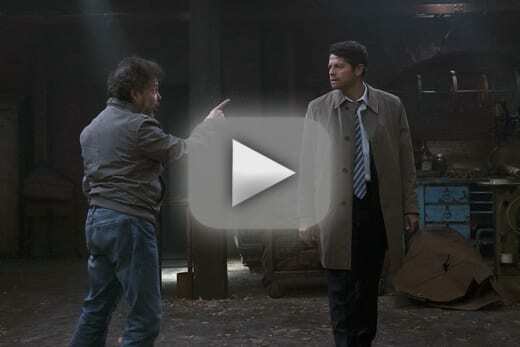 I really don’t think the show will venture into a showdown between Castiel, the Winchesters and God. I expect we will see God only peripherally, as in implications, cameo appearance by Chuck after the fact, etc. - at least that’s what I’m hoping. Alice: It would be rude of him not to make an appearance now that his sister is in town. However, I'm loving the mystery of who God is (I still say Chuck!) and how he stays absent during the absolute worst of times. It’s a mystery of this universe I don’t want to see revealed. On the other side though, how can God not appear? They’re really setting it up for that to be the eventual outcome. I say if he does, it’s our season ending cliffhanger. Christine: I think we have to. But I agree that Sam and Dean working with God seems silly. God has burned them, a lot. I think they'll stay on their free will, and do what works best for them, and mankind. But yeah, I want the God appearance, the Chuck appearance. It's time to put that out there finally. Sean: I just feel like he has to at some point, right? I think the mystery adds something for sure, not ever seeing him, but setting things up with his sister? I guess Sam and Dean could figure out a way to stop a big battle between God and the Darkness before he ever appears. After all, they stopped the apocalypse. What's Crowley to do now that he's been released of daddy duty? Nightsky: At the end of this episode, he was sitting on his throne, thinking. I imagine he’s already working out the various scenarios, planning moves and counter moves. He knows that Amara is stronger than him now. I expect she will do something to endanger his reign or his dominion, and he will once again have to become an ally of the boys. He already mentioned that he “helped put Lucifer back in his cage”, reminding the audience of his previous reason to form an alliance. Alice: I hope we never, ever get to see that asylum hideout again for one. Enough of Crowley sitting on a throne getting bored over soul stat meetings and pining for something better. He’s the boss, why is Hell so bureaucratic? I’d like to see him be more of a menace, out there in the world pushing his agenda, and without all his dumb minions. I also hope that in his current mope he’s coming up with the right plan for world dominance. He’s been on a bit of a losing streak lately. Christine: I'm hoping that Crowley gets back to his old ways. I liked Crowley so much more when he was conniving and posed a real threat. This soft version of Crowley that we've been seeing in the last few seasons has been so far gone from that. Crowley is smart, knows how to work an opportunity… he's the freaking King of Hell. Let's get that Crowley back in action. Sean: I’m at least glad we’re done with Daddy Crowley. I hope. I just want Crowley to be a scary and dangerous menace. That’s what he was good at. No more moping on the throne, please. If that was indeed the cage, what does that mean in the fight against the Darkness? Nightsky: There are so many possibilities! Freed of the Mark of Cain, is Lucifer once again on the side of good? Are he and Michael united in their fight for God’s rule now? Is it Lucifer trying to communicate with Sam, or is it God telling Sam that the archangels are the answer? I’m very excited to see this play out! Alice: Lucifer is the original Mark holder and his soul was corrupted because of the Darkness, so I’m very curious where his loyalty lies. Is he ready to help Amara in revenge against God? After all, God locked him in a cage in Hell for eternity after all. I’m not convinced that being freed of the Mark is going to change him now. He’s been damaged for too long. Who knows though? Maybe this is a great setup for Lucifer and Michael to finally have that end of the world grudge match, one on the side of God, one on the side of Amara. Maybe she plans to use the archangels to settle the score. We need more clues! Christine: Like everyone else, my biggest thought goes right to Lucifer and his allegiances. It would be really interesting to see Lucifer and Michael working together, and to see how the Winchesters react to a completely changed Lucifer. However, if my theory about the absence of the Mark has left Dean faking it is correct, then that would mean a similar story for Lucifer. Maybe I'm totally off base, and I should stop trying to figure it out! Sean: It was a great visual and such a neat reveal. The possibilities are truly endless. Something huge is going to go down, and it definitely involves Lucifer. I just wonder whose side he’s going to wind up being on. There’s an exciting future ahead for Supernatural.